January 1, 2010 / New year’s resolution: achieved! Everything is new! Greywater 4 WordPress theme. One has created version 4.0 of the not-so-venerable “Greywater” WordPress theme. 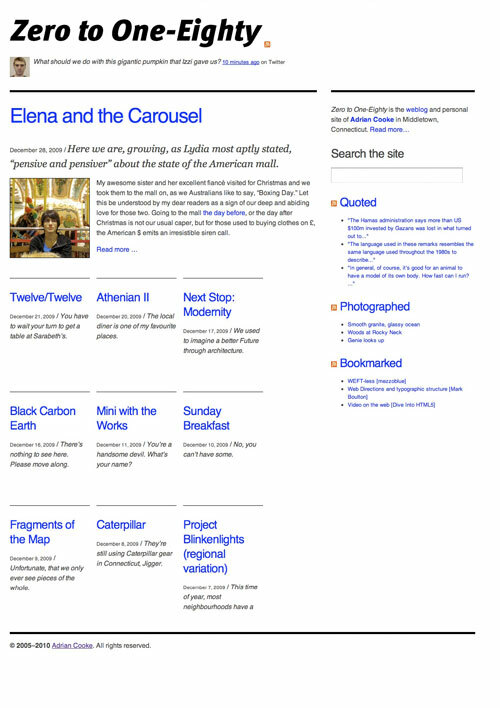 New layout, new feeds from external sites, FF Meta, more hubris, white background, search is back… and I even removed the border on the header image (thanks Lyds)! Oh, and um… happy new year! Throw that in the style, eh? Thanks. Otherwise, nice work!